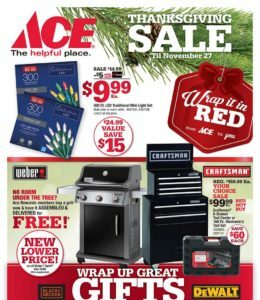 Ace Hardware Black Friday Deals are OUT! ACE Hardware’s Black Friday 5-day Thanksgiving Week Sale starts on Wednesday, November 22nd and will last through Monday, November 27th. Hours will vary depending on location. You can contact your local store HERE for Holiday Hours. Go HERE to check out the full ad scan. 15% off your entire purchase of regular priced merchandise online and in-store on Monday, November 27th only.